How often are Perfect Health Retreats held? Until recently Perfect Health Retreats were held twice a year, in May and October, but due to other obligations (Paul and Shou-Ching’s cancer therapy startup Angiex), we have had to reduce the frequency of the retreats to once per year, in May. Our aim is to provide a first-class experience that includes personal access to Paul Jaminet, Shou-Ching Jaminet, Whitney Ross Gray, and other leaders of the ancestral health movement. Due to the intense engagement we provide retreat participants and our other obligations, it is not possible to hold retreats frequently. Retreats are scheduled during seasons when the weather is good and the ocean is comfortably swimmable at our location on North Topsail Beach, North Carolina (near Wilmington). This restricts the retreat season to May 1 to October 31, when water temperatures are over 75˚F (24 ˚C) (source: NOAA). The weather, too, is generally comfortable in Wilmington throughout this period; for example, in May average daily highs are around 81˚F (27˚C) and nightly lows around 58˚F (14˚C) (Source: Accuweather). There is a hurricane risk in the fall. 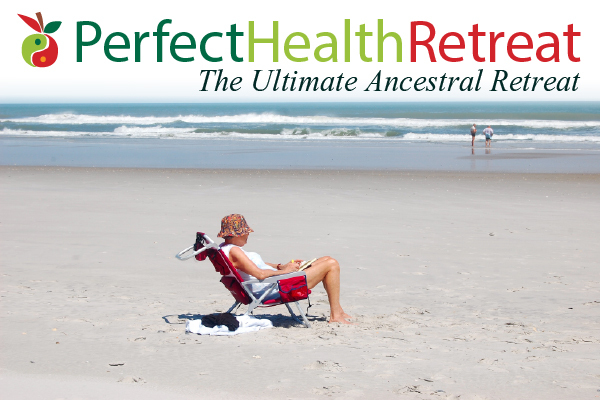 Where are Perfect Health Retreats held? Retreats are held on North Topsail Beach at the most luxurious properties we have been able to find on the North Carolina coast. See our Setting page for details. Will future Perfect Health Retreats be held at the same site? Very likely, yes. We are committed to providing a luxury retreat in a delightful setting. We want a Perfect Health Retreat to be an experience that is treasured for a lifetime. We have currently selected the most luxurious and retreat-suitable property we could find in the state of North Carolina. How long are Perfect Health Retreats? We have experimented with various lengths. During our pilot period we tested 30 day retreats, and the May 2014 retreat was two weeks in length. For October 2014 we used a mixed format: guests could attend for two weeks October 4 to 18, or for single weeks October 4-11 or October 11-18. We have concluded that one week works well for most people, and that those who want a longer experience would be best served by coming a second time to a “graduate” retreat with a more advanced curriculum designed specifically for retreat alumni. As a result, we are now offering only single week retreats. The next retreat will take place April 30 to May 7, 2016. (For residents of the United States:) Can the cost of a Retreat be paid using my Flexible Spending Account? Yes, but you may need a letter from your doctor stating that the Retreat serves a medical purpose, such as weight loss. If I want to learn more about Perfect Health Retreats, what should I do? Paul Jaminet, paul@perfecthealthretreat.com and 617-576-1753. Whitney Ross Gray at whitney@perfecthealthretreat.com and 910-763-8530. Soon, we’ll also have a Perfect Health Retreat mailing list. Watch for it and sign up; this will enable us to keep you up to date with information about Retreats. You’ll be the first to know when new Retreats are scheduled, which special guests may be coming to the retreat, and other news. Are there persons for whom the Retreat would be unsuitable? Yes. The retreats are intended to teach you how to live an ancestral diet and lifestyle in the modern environment. If you have medical conditions that prevent you from caring for yourself, prevent you from participating in physical activity, or require frequent access to medical care, then the Retreat is probably not suitable for you. The Retreat has no medical staff and provides no medical care. You are responsible for arranging any medical care that you may need during your time at the Retreat. On the other hand, lack of physical fitness or common chronic ailments such as obesity or diabetes present no obstacle to attending the Retreat, so long as you are able to care for yourself and engage in essential physical activities such as climbing stairs. Although both buildings have elevators, ability to climb stairs is a good measure of the level of health needed to attend the Retreat. Is it possible to bring children? It is possible. However, to ensure that children (especially infants) do not disturb other guests, we may rent a neighboring property a short walk from the retreat center for your family. Be aware that no child care is provided by the retreat. We therefore recommend that both parents come along with any children, so that one may tend to the children at all times. OK, I want to come. What is the process of purchasing a place at the Retreat? Simply contact Paul or Whitney and say you want to make a reservation. We’ll send you a Paypal invoice for the reservation deposit of $900 per room. The reservation deposit is non-refundable but postponable to any future retreat. Once it is paid, you have your choice of available rooms. Rooms are assigned on a first-come first-reserved basis. About seven weeks in advance of the retreat, we will ask you to sign a guest agreement; it describes what can and cannot be done as guests of the Retreat, and the nature of our mutual obligations. Signing of the guest agreement triggers the start of pre-retreat health coaching. Signing the guest agreement also commits you to a schedule of non-refundable payments. Travel insurance will be available to protect you in case unforeseen contingencies prevent your attendance at the Retreat. The reason payments become non-refundable as the Retreat approaches is that we want to keep prices affordable, while delivering a luxurious experience. To do this, we need to be able to sell out the Retreat. But many guests need to make travel plans several months in advance, so it is likely to be impossible to replace a guest who makes a late cancellation. Half the remaining balance is due 45 days before the start of the Retreat, and the remainder is due 15 days before the start. How do I make travel plans? The best place to fly into is Wilmington International Airport (code ILM), located 47 miles (one hour) from the Retreat site and just 4 miles from Perfect Health Retreat offices in downtown Wilmington. We provide free transport from Wilmington to and from the Retreat site. Alternatively, you can fly into the next closest airport, Raleigh-Durham International Airport (code RDU), located 158 miles (two and one-half hours) from the Retreat site. This has more flights but you would be responsible for your own ground transportation if you fly into RDU. This might make sense if you are renting a car. We encourage you to arrive at Wilmington airport by 3 pm on the arrival Saturday. Check out is at 9 am on the departure Saturday. You may use our offices at 254 N. Front Street, 4th floor, Wilmington, on arrival and departure days if you need space in Wilmington before or after checkout. It is possible to arrive the Friday before the retreat — some international guests have found this makes for easier flight planning — but there are no retreat services and no cooking, only accommodations. Including on-street parking, there is sufficient parking for every guest to bring a car to the Retreat. However, most guests find they do not use their cars while at the Retreat. We do not recommend renting a car. What other interactions will I have with the organizers before the Retreat? Information Packet. We’ll provide detailed information about what you can expect at the Retreat, such as a description of Retreat amenities (for example, washer, dryer, WiFi, television), things we will provide at the Retreat (for example, exercise equipment, games, beach gear), things we recommend that you bring (for example, clothing, footwear, sun protection), background about the local area and suggestions for ways to spend free time, and details on the schedule of activities. Whether you have any food sensitivities, allergies, or special dietary needs. Whether you have injuries, pain, restricted motion, or medical conditions that limit your physical activity. A description of your current diagnosed health conditions, pharmaceutical drug prescriptions, and supplementation practices. A summary of recent biomarkers and medical lab test results. An opportunity to inform us of your personal goals for the Retreat. Diet and Lifestyle Advice. We’ll provide a digest of Perfect Health diet, nutrition, and lifestyle advice. The goal here is to encourage you to start living at home some of the health-improving practices that we’ll teach at the Retreat. By trying to implement them at home, you’ll come to the Retreat already armed with questions, and will get more value out of the experience. It also gives you a headstart at enjoying some of the health improvements that come from the Perfect Health way of eating and living. Health Coaching. After we receive your Intake Questionnaire, Paul Jaminet and Laura Schoenfeld, the health coaches of the retreat, will schedule a pre-Retreat interview by Skype or telephone. This will allow us to discuss your health in detail and provide personalized recommendations for how you can improve your health through natural (diet, nutrition, lifestyle) interventions. What interactions will I have with the organizers and other Retreat participants after the Retreat ends? We hope that you will make new friends at the Retreat, with us and the other guests, and will want to stay in touch. To encourage this, we have a created a Perfect Health Retreat Alumni group on Facebook and will invite you to join. We offer continued free health coaching to anyone who is willing to share their health outcomes. This will enable us to assess the long-term health outcomes of following the Perfect Health diet and lifestyle. We would ask you to periodically provide key biomarkers (such as weight, waist circumference, blood pressure, and pulse rate), medical lab tests, and changes in your diagnosed health conditions. Results of this study would be published (with complete anonymity for participants) in the Ancestral Health Society’s Journal of Evolution and Health. Of course, participation would be completely voluntary and at your option. The goal of the study is scientific: to quantify the benefits of an ancestral diet and lifestyle. If, as we believe, substantial health benefits will be achieved from following Perfect Health advice, we would like to prove that to the larger biomedical community. Your participation might help many others learn how to improve their health and extend their lives. I would like to obtain your book Perfect Health Diet in the spanish language, please let me know where can I find it. I’m afraid it hasn’t been published in Spanish yet. Is the translation to Spanish in the works? Unfortunately, no Spanish-language publisher has yet purchased the rights. Can I make an appt with the Jaminets if I’m unable to attend a retreat?